"Dr Hibernica Finch’s Compelling Compendium of"
Copyright © 2018 Aga Grandowicz, Rob Maguire. This image is available for reuse purchase. Aga Grandowicz Description'Dr Hibernica Finch’s Compelling Compendium of Irish Animals' is an illustrated guide to Ireland’s animals for young readers. Shortlisted for the Irish Book Awards in the Best Irish-Published category, 2018. 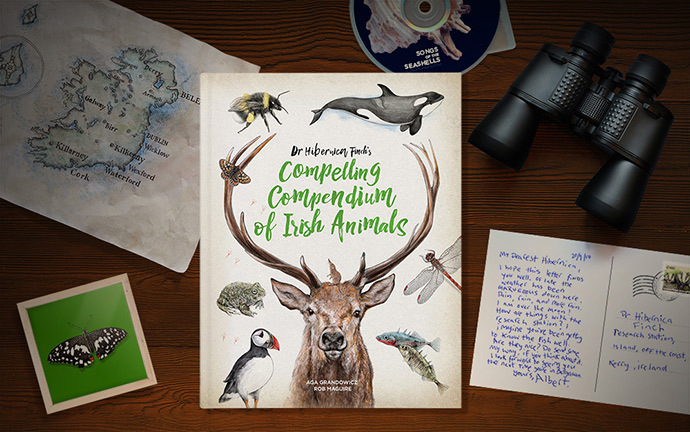 Dr Hibernica’s Compelling Compendium of Irish Animals celebrates the diversity and wonder of Ireland’s fauna – from the tiny Eurasian pygmy shrew to the enormous killer whale – with exquisite zoologically correct illustrations and light-hearted prose. Giving loving and detailed information about the robins, puffins and owls of the air, the toads, seals, and basking sharks of Ireland’s waters, and the hedgehogs, otters and deer with whom we share the land, this is a treasure of a book with details of twenty-eight of Ireland’s most compelling and iconic animals. The animals are introduced to the reader by Dr Hibernica, a fictitious Irish zoologist who travels the country and knows everything there is to know about Irish wildlife. The Compendium is presented in the style of her notebook and field notes, with jokes and sketches throughout. The book was the idea of Irish-Polish illustrator Aga Grandowicz, who originally wanted to be a vet, and to this day spends some of her happiest times drawing animals. She joined forces with Bray native Rob Maguire, who supplied the witty, entertaining and informative prose – despite being allergic to animals. They also worked closely with Nicola Marples, Professor in Zoology at Trinity College Dublin, who shared her knowledge of the animals of Ireland and checked every fact – furry, fishy or flighty – in the book.